With tree-lined avenues and hilltop views, the ACP Estate in Accra already feels greener than much of Ghana’s fast-growing, densely populated capital. It has the appearance of a comfortable suburb: leafy, peaceful and wholesome. But the yard of Florence Benson is more than just green. It also boasts a constellation of oranges, purples, reds, yellows and brilliant whites. They are orchids, the work of a former civil servant who has turned her passion into an unlikely, word-of-mouth-driven home business, and who now counts a university campus and an innovative children’s park among her public projects. “Auntie Florence” emerges from the foliage to meet us in a flowing green dress, like the spirit of the place come to life. Benson’s market is small but lucrative — many miles from the cut flower mega-producers of Kenya or Ethiopia, both literally and metaphorically. She sells to other orchid enthusiasts and to wealthy individuals, some of whom are willing to spend hundreds of US dollars on ready-to-go prestige plants. User-friendly Vandas, a culture that takes well to Ghana’s semi-tropical climate, are a top seller. She is also emblematic of the struggle to create and preserve green space, recently agreeing to work on Accra and Spokane-based charity Mmofra Foundation’s Playtime in Africa project. Designed to promote educational and exploratory play, its plan features rain gardens, wild areas, performance spaces and vegetable patches. It is mould-breaking stuff for a West African city, and follows on from her work on the campus of Ashesi University College, founded by former Microsoft engineer Patrick Awuah. Both projects are linked to the green-minded Ghanaian architect Ralph Sutherland, an old friend. As we stand in the mid-morning sun, Benson outlines the challenges of intensive home production in Accra. It has been an “expensive learning curve” that has forced her to be creative, designing her own materials and harvesting rainwater for the dry season. At the same time, her public work must take into account the region’s clay-heavy, nutrient-poor soil; between the potted orchids there are beds filled with hardy green shrubs that can tough out the local conditions. Signs of resourcefulness and efficiency come thick and fast. Popular growth mediums like fibre and bark quickly rot in the humidity, so orchids are planted in charcoal. Pots with sufficient air flow and drainage must be made bespoke, and hanging structures are constructed at home, with their slats positioned north-to-south to maintain a balance of light and shade as the searing sun moves overhead. They also create multi-level areas, helping to increase production. For general fertiliser there is dried cow manure from a nearby farm, supplemented with a Ghanaian-made organic feed — though the latter has recently tripled in price. And with budgets tight and specialist orchid knowledge rare, she has trained her own garden hand, a local man named Kwesi. Finally, there is a rain harvesting system that channels runoff into a concrete-lined underground reservoir. “Rains from September and October can keep us going into January,” she says, inviting us to peer into the gloom. There is an element of necessity here, too: Ghana’s gardeners cannot rely on municipal water services. Over pineapple juice made from the produce of local farms, we turn to cultural challenges. 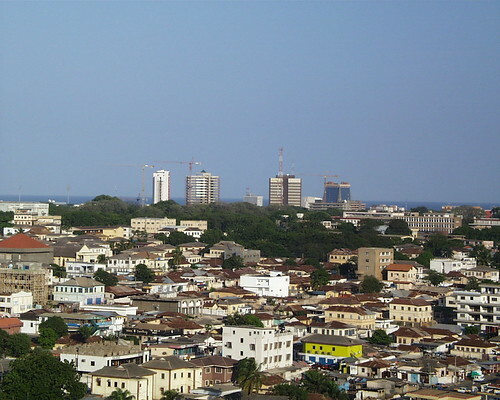 Ghana does not have a strong floricultural tradition, and the development of Accra has not been kind to trees and parks. “Accra is less beautiful than it has been,” she says. “I remember when they pulled all these beautiful trees down at the Cantonments roundabout. The British Women’s Association wore red headbands [in mourning].” She also points to the recent removal of mature mahoganies along Atomic Road, near the University of Ghana, and reflects that the country “just doesn’t have a planning system.” The appeal of the Ashesi and Playtime in Africa projects becomes clear — here, against the trend for unchecked development, are people arguing for the importance of urban green space. Visit over, we are sent away with young Vandas and instructed to try and make them bloom. Weeks later, mine is still flowerless. Making urban Ghana beautiful is tough, and that makes this thriving business seem all the more extraordinary. Nathan Midgley is an Accra-based British journalist. He writes the blog Sushi in Accra. This entry was written by Nathan Midgley , posted on Sunday January 13 2013at 05:01 am , filed under Africa and Middle East, Environment, Public Space, Society and Culture and tagged Accra, Ghana, Urban Agriculture, Urban Greening . Bookmark the permalink . Post a comment below or leave a trackback: Trackback URL.